I want to start off by saying that I liked this issue a lot. I like the bigger story that we can feel brewing behind the scenes as well, and taken out of context as a stand-alone story, it’s top notch. But I can’t help feeling just a little conflicted. The beginning of this issue is set a few days after the end of the last, as evidenced by the fact that the details of the deal between Matt and Wilson Fisk have begun to crystallize and their plan to take down the Hand is set in motion. There is immediate doubt, however, regarding just how much Matt knows about the methods the Kingpin intends to use as the first few pages show the latter breaking Leland “the Owl” Owlsley out of custody. The Owl is a character which I certainly hadn’t longed or expected to see back, but who is put to very good use at the end of the issue. There’s a great sense of a well conceived plot at play in this issue which reminds us of what Brubaker does best. The criminal mastermind disguised as a comic book writer, whom I got a real sense of when I finally decided to pick up his Criminal recently, leads us through the sordid consequences of the unholy alliance between Matt and the Kingpin, and the storytelling feels really tight. While I still have the same concerns as I did at the end of last issue (regarding why Lady Bullseye is still even interested in harrassing Daredevil), they are easier to dismiss this time around with the pace picking up and the stakes being raised. Another great scene is the one between Matt and Foggy. While I don’t want to spoil the issue for anyone who hasn’t read it, suffice it to say that Foggy manages to shake the final vestiges of the lovable goof persona which held him back as a character for much of the first thirty years of Daredevil history. The only negative here is that it further highlights just how low Matt has sunk. 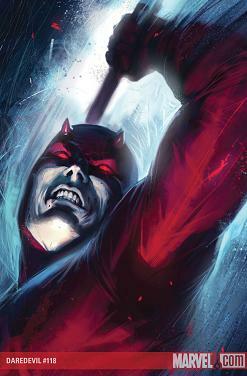 While his deal with Fisk is incredibly intriguing and makes a perfect kind of sense, as Matt himself explains in this issue, there are aspects of Matt’s behavior and reasoning that, combined with what has been going on for the last couple of years, are making him less and less likable as a character. I do believe this is something that Andy Diggle will have to address in some way, if Brubaker doesn’t beat him to it with the final two issues of his run. I love the humanity and frailty of Matt Murdock as a character and I don’t mind his many flaws, but he is beginning to lose my respect and that is not the kind of development that I would like to see. The art is good, as always, and the snow falling on Manhattan looks great on the page. I love the way Lark can make even the more exotic characters like the Owl look realistic while still being true to their original, more cartoonish, appearance. Lady Bullseye is also beautifully drawn and I have nothing negative to say about the art team at all. With a full two months until the next issue, we will have plenty of time to digest the events here and to engage in fun, yet futile, speculation of what final surprise Ed Brubaker might have up his sleeve. With all of the pieces of plot set in motion here, I’m excited to see where this all might lead, but I have to admit that a big part of me hopes for some kind of spiritual redemption for my favorite guy in red. It’s beginning to seem long overdue. As for Fog… Of late, Matt had been scolded into reaction by Dakota or Becky, while Foggy was on a sobter side: that is, “hum I have my objections, but I’m at your side, pal”… But now he’s really really angry (even if the “fired” is of course, rethorical: Matt is not an employee but a partner). The curious thing is… It was to be expected: the way Matt has been reacting to his very pressing circumnstances only puts him in worse situations and estranges him from his friends and allies. This is not exactly like the “circle of pain” discourse Foggy gave Matt back in the Bendis Era. Since then, Foggy has gone through “death” and , in #93 (remember hi words to Matt back then about the wisdom of letting Fisk go!) he seemed ready to stick to his partner whatever the difficulties… and yet, his explosion is not all that surprising: Brubaker has been building this reaction slowly but steadily, only that the resignated “nah… he won’t listen”. Still, watch Matt’s reaction, he seems unable to heed Master Izo’s drops of eastern wisdom and good advice in beer consumption, and reacts quite detachedly to Izo’s remarks… But Foggy’s last words just leave him frozen: Will this make him react, finally? Thanks for commenting Gloria! It sometimes seems people comment less these days even as the stats keep going up. Many good points all around. Brubaker writes the hell out of the Kingpin and the story here is really exciting. But I’m seriously wondering if and how he ever intended to “rebuild” Matt. It’s kind of like how I doubt that Bendis really had a way to fix the secret identity. As much of a Brubaker fan as I am, I have to say that he really hasn’t delivered what he said he would. Isn’t 8.5 a bit too generous? I personally wouldn’t give this issue more than 6.5. @Francesco: Christine’s pretty generous with her reviews. Remember when she said “6.5” was a low score!